So anime is going to be a big thing around these parts. We consider ourselves self-taught experts, as we’ve been seriously watching for well over a decade now. Oh man, after thinking about that, it’s been actually closer to being over 15 years! I’m sure all of the old anime fans in the crowd can remember the days when you almost had to set out on an expedition just to get a tape, that if you were lucky it had more than one episode on it. Those were the Wild West days of anime in the US. Now, things are much better. Anime is still a popular niche category and great titles are coming out closer and closer to the airing dates in Japan. Which brings us to our show of interest – Guilty Crown. 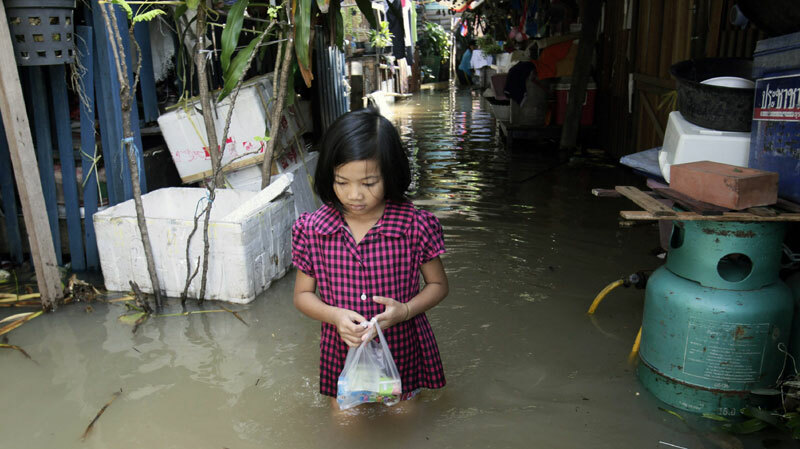 A Thai girl wades through a flooded alleyway near the Chao Phraya River, in Bangkok on Wednesday, Oct. 27, 2010. All kidding aside, Thailand has been getting rocked by some major flooding in the past month. For those of you who haven’t heard, and I’m going to assume that’s most of you, the flooding started roughly around the middle of July and has been since. Media coverage has been lighter than when tragedy struck Japan andvthe public conscious hasn’t been wrapped up in it anywhere near as much. There are a number of reasons I can think of, but none of them are the point of this piece. So why talk about how flooded Thailand is right now?